In my last post, I suggested that the NYSE TICK was an effective short-term measure of sentiment and illustrated a common trading setup utilizing the TICK. In this post, I'll show you an application of the TICK that you're unlikely to have encountered anywhere else. 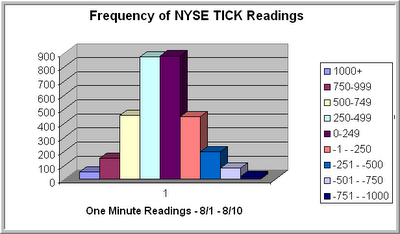 The chart above displays the frequency of closing one-minute NYSE TICK readings for the past eight sessions. I used eight sessions as my lookback period, because the S&P 500 Index has been relatively flat during that period. What that tells me is that this distribution of TICK values (i.e., this distribution of trader short-term sentiment) has been associated with a relatively trendless S&P market. Note that the median TICK value in the sample is not zero; it is +237. We also tend to have fatter tails on the positive side of the TICK than the negative. (Not shown on the chart are two data points below -1000). Now how can we use this information to determine the psychology of the market? My research suggests that, if the relatively flat trading action of the past eight sessions is going to transition to a trending market, we will need to see a shift in the distribution of NYSE TICK values. Such a shift indicates that either buyers are more aggressive in taking offers or in hitting bids. By comparing the distribution of today's TICK readings to the recent distribution, we conduct a running assessment of trader sentiment and whether it is bullish (more positively weighted than the past eight days), bearish (more negatively weighted than the past eight days), or neutral (similar to the past eight days). It is the distribution of TICK values--and not any single reading in itself--that is significant, indicating shifts in trader sentiment. The beauty of the indicator is that it measures sentiment via trader actions, not their stated beliefs. By viewing TICK distributions in relative terms--comparing today's market to recent markets--we can learn more about those shifts in trader sentiment than we can by focusing on the absolute value of the TICK readings. A quick and dirty way of accomplishing this is to subtract the median value of the TICK for the lookback period (+237) from each closing one-minute value. If this Adjusted TICK, when cumulated, creates a positive sloping line, you know you have net relative positive sentiment. If the summed values of the Adjusted TICK create a negatively sloping line, you know you have relatively bearish sentiment. Composite NYSE TICK readings (adjusted for recent lookback periods) are summarized daily on the Trading Psychology Weblog. (Note: the Weblog measure uses 10 second readings of the TICK, not one-minute values). In the third post in this series, I will show how these composite readings make the TICK relevant and useful for longer timeframe traders. The best indicators, I find, are ones that tap into the psychology of the marketplace itself.